The fundraising ‘Walk for Cancer Care’ to help cancer patients obtain treatment has been launched. The activity, organized and hosted by the Dominica Cancer Society annually, is scheduled for Saturday 6 October 2018 was launched on the ground floor of Government Headquarters on Wednesday 15 August 2018. It will be conducted from two points; Point Mitchel to the Dame Mary Eugenia Charles Boulevard (Bayfront) in Roseau and from Mam’s Supermarket in Massacre to the Dame Mary Eugenia Charles Boulevard (Bayfront) and culminates at the Windsor Park Stadium with a closing ceremony. Public Relations Officer of the Society, Vinna Royer, who appealed for the public’s support while addressing the launching ceremony, informed that a target of raising one hundred thousand dollars ($100.00) has been set for this year’s event. The Society has distributed sponsor sheets to solicit financial contributions, while the t-shirts to be worn during the walk will be available for purchase at a later date. 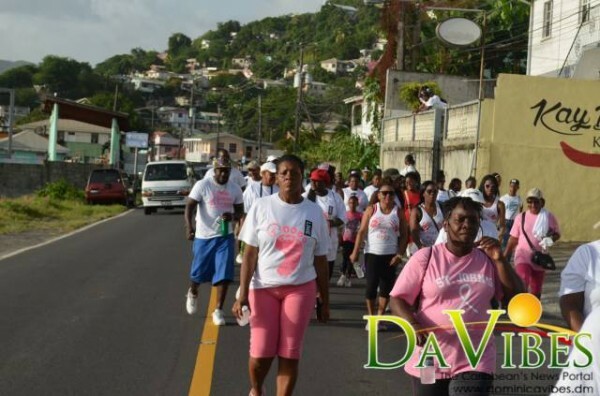 Royer said the Dominica Cancer Society “took a bold step” in 2012and initiated the ‘Walk for Cancer Care’ because “we needed to assist persons who could not find the funds for chemotherapy, or who would not even be thinking about going overseas for radiation/radiotherapy”. Initially, she added, the Society started off with a message of early intervention “and we insisted that we would not be dealing with funds because we had no money, but we wanted to reach out to people who have cancer and we’ve been doing that in our various sub-groups”. Royer acknowledged that the walk has become increasingly popular and widely supported by citizens and businesses. “We know that the walk has become very, very popular and people are looking forward to the exercise walk. We want to appeal to people to be a little more even more excited about the fundraising, which is the central purpose of the walk,” Royer said.